It is being widely reported that Google will be launching its Chrome OS based Tablet on Verizon. The tablet is being reported to be built by HTC and the launch date is set to November 26th which is also the Black Friday for 2010. The tablet’s specifications are still unknown while it is being rumored that NVIDIA’s Tegra 2 as the likely choice of hardware and if HTC will work along is not known. The tablet is also said to have a usual capacitive touchscreen, WiFi, GPS, Bluetooth and also a webcam. Will Google’s Chrome OS Tabet be the iPad killer? Its hard to say without having to actually look at the device but speculation is that it might get close in this battle to be the best. 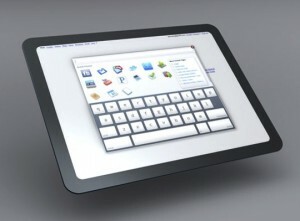 iPad has had its fair share of the market and is already working on iPad 2 which is speculated to be out by December. Next Ripoff? BlackBerry Torch costs $171 to Make! I hope it will be not as heavy as the iPad … But it looks good anyway!